Heat oven to 350°F. Combine the sugar and cinnamon in a bowl. Sprinkle flour onto work surface; knead flour into cookie dough. Tear off teaspoon-sized balls of dough and roll between your hands to create a smooth ball. 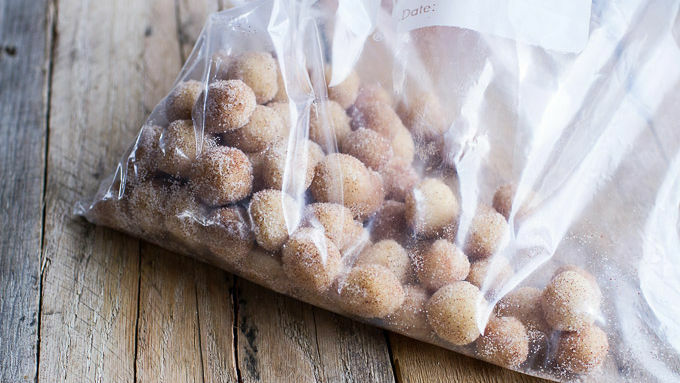 Add all but 2 teaspoons of the cinnamon sugar to a gallon-sized zip-top bag. Reserve the remaining 2 teaspoons of cinnamon sugar for later. Add the cookie balls to the bag and seal it. Gently toss the balls with the cinnamon sugar until all the cookie balls are coated. Place the cookie balls 1 inch apart on a parchment-lined cookie sheet. Bake five minutes or until set. Remove and allow to cool. Reduce oven temp to 300°F. Meanwhile, place the brown sugar, corn syrup, and 1 tablespoon of butter in a heavy bottomed skillet. Place the skillet over medium heat. Stir the mixture until it comes together and bubbles. 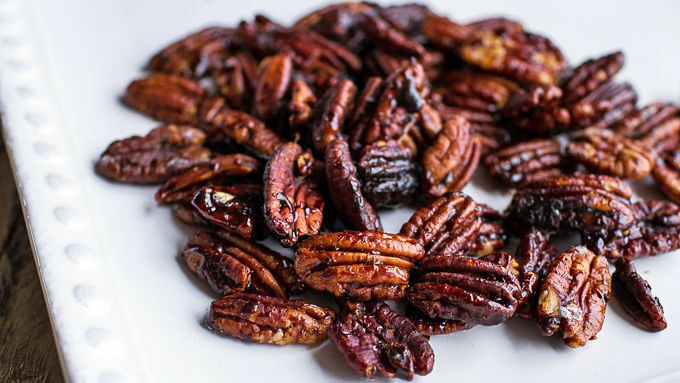 Add the nuts and toss well; cook for 5-8 minutes or until the nuts are toasted and caramelized. Stir the nuts often to ensure they don’t burn. Transfer from the skillet to a plate lined with wax paper. In a large bowl toss together the cereals, melted stick of butter, vanilla and 1-2 teaspoons of the remaining cinnamon sugar from earlier. Toss well and then spread out between two cookie sheets. Bake for 15 minutes at 300°F, stirring once or twice during cooking. Remove and allow to cool. 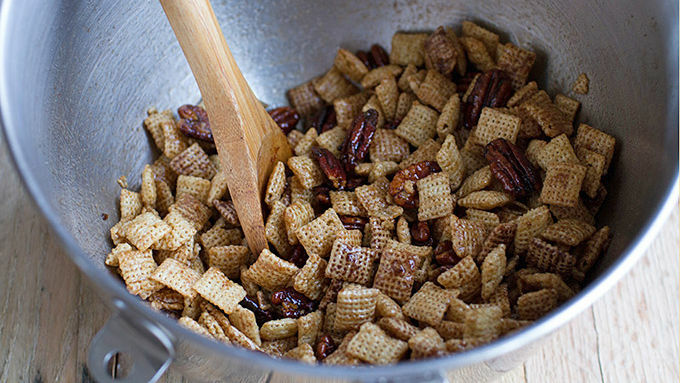 Once cool, add the cereal, snickerdoodles and pecans to a large bowl and toss well. Serve. This makes A LOT of mini snickerdoodles. 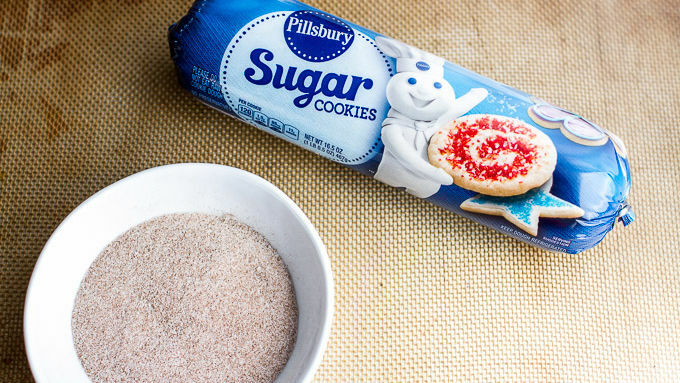 If you don't want to make so many, just use half the Pillsburry dough. This can be made a few days in advance. Store in an airtight container until ready to serve. And you thought you'd had Chex Mix before. You guys, can you feel it? Can you feel fall coming? Because I totally can ... and well, I am excited. The thought of the cool brisk air, the crunchy orange and red leaves under my feet and all the crisp apples is driving my crazy. I know that we still have a week or so left before fall officially starts, but where I live, you can definitely tell the weather is changing. Mornings and nights are cool, the long days of sunshine are now interspersed with cozy rain and, sadly, the sun is setting earlier and earlier with every day. All signs point to the changing of the seasons. With the slightly cooler weather and rainy days, I've been craving the comfy, inviting flavors of cinnamon. Cinnamon to me is fall. 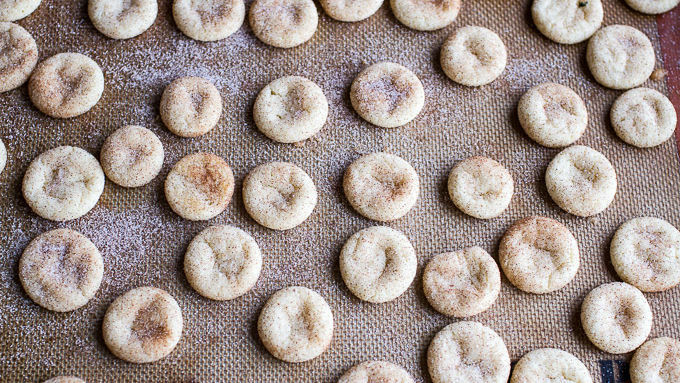 A great reason to bake up a batch of fresh snickerdoodles cookies and make a batch of homemade snickerdoodle Chex Mix. Yes! 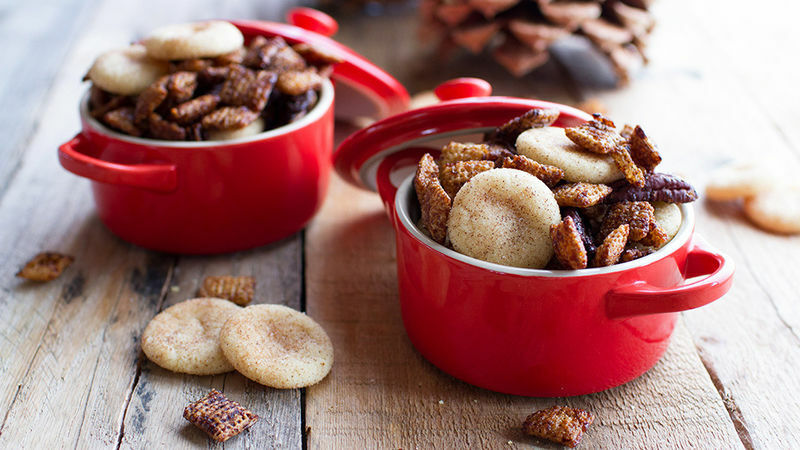 Serve this Chex Mix in cute fall bowls and people will go crazy for this. It’s the perfect autumn snack!